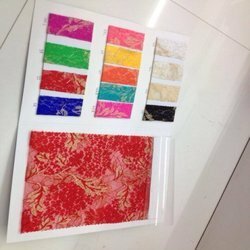 Prominent & Leading Manufacturer from Surat, we offer rasal full jari fabric, net fabric, net glitter work, embroidery work, fancy net work fabric and rasal net with colors range fabric. 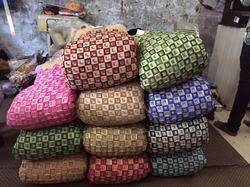 We are one of the leading manufacturers and suppliers of Rasal Full Jari Fabric. The offered net fabric is very commonly used for making sarees, blouse and sleeveless ghagra choli. Our supplied net fabric is highly liked, due to color fastness and elegant designs. The offered net fabric is highly appreciated for intricate patterns and designs. We are one of the leading manufacturers and suppliers of Net Fabric. 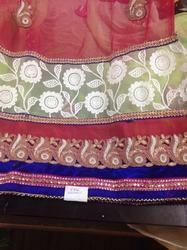 The offered net fabric is very commonly used for making sarees, blouse and sleeveless ghagra choli. Our supplied net fabric is highly liked, due to color fastness and elegant designs. The offered net fabric is highly appreciated for intricate patterns and designs. 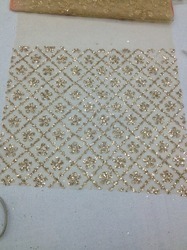 We are one of the leading manufacturers and suppliers of Net Glitter Work. The offered net fabric is very commonly used for making sarees, blouse and sleeveless ghagra choli. Our supplied net fabric is highly liked, due to color fastness and elegant designs. The offered net fabric is highly appreciated for intricate patterns and designs. We are one of the leading manufacturers and suppliers of Fancy Net Work Fabric. The offered net fabric is very commonly used for making sarees, blouse and sleeveless ghagra choli. Our supplied net fabric is highly liked, due to color fastness and elegant designs. The offered net fabric is highly appreciated for intricate patterns and designs. 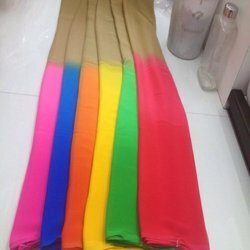 We are one of the leading manufacturers and suppliers of Rasal Net With Colors Range Fabric. 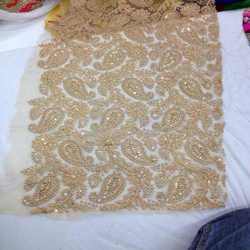 The offered net fabric is very commonly used for making sarees, blouse and sleeveless ghagra choli. Our supplied net fabric is highly liked, due to color fastness and elegant designs. The offered net fabric is highly appreciated for intricate patterns and designs. We are one of the leading manufacturers and suppliers of Rasal Padding Fabrics. The offered net fabric is very commonly used for making sarees, blouse and sleeveless ghagra choli. Our supplied net fabric is highly liked, due to color fastness and elegant designs. The offered net fabric is highly appreciated for intricate patterns and designs. We are one of the leading manufacturers and suppliers of 60 Gram Shiffon Padding fabrics. The offered net fabric is very commonly used for making sarees, blouse and sleeveless ghagra choli. Our supplied net fabric is highly liked, due to color fastness and elegant designs. The offered net fabric is highly appreciated for intricate patterns and designs. We are one of the leading manufacturers and suppliers of Net Sequence Work fabrics. The offered net fabric is very commonly used for making sarees, blouse and sleeveless ghagra choli. Our supplied net fabric is highly liked, due to color fastness and elegant designs. The offered net fabric is highly appreciated for intricate patterns and designs. 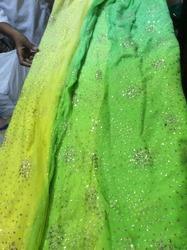 We are one of the leading manufacturers and suppliers of Georgette Work Fabrics. The offered net fabric is very commonly used for making sarees, blouse and sleeveless ghagra choli. Our supplied net fabric is highly liked, due to color fastness and elegant designs. The offered net fabric is highly appreciated for intricate patterns and designs. We are one of the leading manufacturers and suppliers of Rasal Net Fabric with Colors Range. 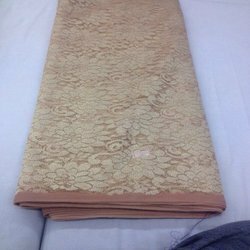 The offered Rasal Net Fabric with Colors Range is very commonly used for making sarees, blouse and sleeveless ghagra choli. Our supplied net fabric is highly liked, due to color fastness and elegant designs. The offered net fabric is highly appreciated for intricate patterns and designs. 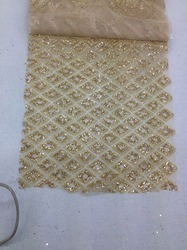 We are one of the leading manufacturers and suppliers of Net Glitter Work fabrics. The offered net fabric is very commonly used for making sarees, blouse and sleeveless ghagra choli. Our supplied net fabric is highly liked, due to color fastness and elegant designs. The offered net fabric is highly appreciated for intricate patterns and designs. We are one of the leading manufacturers and suppliers of 4d Net Glitter Work. 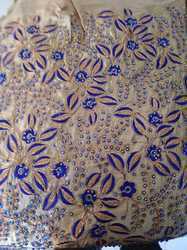 The offered net fabric is very commonly used for making sarees, blouse and sleeveless ghagra choli. Our supplied net fabric is highly liked, due to color fastness and elegant designs. The offered net fabric is highly appreciated for intricate patterns and designs. We are one of the leading manufacturers and suppliers of Net Mirror Work fabrics. 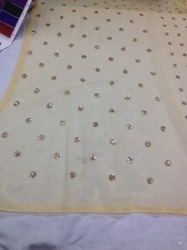 The offered net fabric is very commonly used for making sarees, blouse and sleeveless ghagra choli. Our supplied net fabric is highly liked, due to color fastness and elegant designs. The offered net fabric is highly appreciated for intricate patterns and designs. We are one of the widely acclaimed manufacturers and suppliers of Round Net Embroidery Fabric. The offered Round Net Embroidery Fabric is specially designed by fusing and looping the yarns at intersections. Our supplied designer net fabric is widely acclaimed by girls and women of all age groups and sections. We are one of the well-known manufacturers and suppliers of net work . The offered Banarasi Work Saree is liked for beautiful patterns and lovely designs. Our supplied net work is very popular among women of all age groups and cultures. The offered Banarasi Work Saree is highly appreciated for color fastness and elegant designs. We are one of the well-known manufacturers and suppliers of Georgette work. The offered Georgette work is liked for beautiful patterns and lovely designs. Our Georgette work Saree is very popular among women of all age groups and cultures. The offered Georgette work is highly appreciated for color fastness and elegant designs. Looking for Designer Net Works ?